Nurse-like stromal cell lines from the synovial tissue of patients with rheumatoid arthritis (RA-SNC) produce, on coculture with lymphocytes, large amounts of proinflammatory cytokines. In the present paper, we analyze the molecular events necessary for the induction of cytokine release from RA-SNC cells, and particularly the roles played by cell adhesion and the transmigration (also known as pseudoemperipolesis) of lymphocytes. For this purpose, the effects of various mAbs on the binding and transmigration of a human B-cell line, MC/car, were examined using a cloned RA-SNC line, RA-SNC77. To analyze the role of lymphocyte binding and transmigration on upregulated cytokine production by the RA-SNC77 cells, we used C3 exoenzyme-treated MC/car cells, which could bind to RA-SNC77 cells but could not transmigrate. Treatment with anti-CD29 or anti-CD49d mAb significantly reduced binding and transmigration of the MC/car cells. In contrast, the neutralizing anti-CD106/vascular cell adhesion molecule 1 mAb did not show any inhibitory effect. Likewise, none of the neutralizing mAbs against CD11a, CD18, CD44, CD49e, or CD54 showed significant effects. Binding of C3-treated or untreated MC/car cells to RA-SNC77 cells induced comparable levels of IL-6 and IL-8 production. In addition, the enhanced cytokine production by RA-SNC77 cells required direct lymphocyte contact via a very late antigen-4 (VLA-4)-independent adhesion pathway. These results indicate that, although both the VLA-4-dependent/vascular cell adhesion molecule 1-independent and the VLA4-independent adhesion pathways are involved in MC/car binding and subsequent transmigration, only the VLA4-independent adhesion pathway is necessary and sufficient for the enhanced proinflammatory cytokine production by RA-SNC77 cells. The transmigration process, which is dependent on Rho-GTPase, is not a prerequisite for this phenomenon. Nurse cells were first recognized in the thymus, where they form a unique cellular complex with thymocytes [1, 2] and have been implicated in the positive and negative selection of the developing thymocytes [3–6]. We previously established nurse-like stromal cell lines from the synovial tissue of patients with rheumatoid arthritis (RA-SNC) . These stromal cell lines are large adherent cells with multiple long cytoplasmic projections, and are morphologically distinct from typical fibroblasts or macrophage-like cells. When cocultured with lymphocytes, the stromal cell lines avidly bind the lymphocytes and readily allow them to transmigrate beneath the RA-SNC cells. This cellular interaction, pseudoemperipolesis, is a characteristic feature of nurse cell interactions with lymphocytes. The RA-SNC are capable of supporting cell proliferation and immunoglobulin secretion of B cells in vitro, and they spontaneously produce a variety of proinflammatory cytokines . On direct cell-to-cell contact with lymphocytes, RA-SNC secrete a large amount of proinflammatory cytokines, including IL-6 and IL-8 . Because the stromal cells with the apparent nurse-cell-like activity can be generated from long-term cultures of synovial tissues or bone marrow of rheumatoid arthritis (RA) patients, but not from non-RA controls, we speculated that the nurse-like cells might contribute to the dysregulated immune responses observed in RA patients by interacting with infiltrating lymphocytes in the microenvironment of the RA synovial tissue or bone marrow [7–9]. The cellular and molecular events leading to the enhanced proinflammatory cytokine production by the RA-SNC have not, however, been fully characterized. In the present study, we attempt to characterize the molecular events required for enhanced cytokine production by RA-SNC, and examine the adhesion pathways involved in the interaction between lymphocytes and a cloned nurse-like cell line, RA-SNC77, generated from the long-term culture of RA synovial tissues. We also examine the relative contribution of lymphocyte binding and subsequent transmigration to the accelerated proinflammatory cytokine production by the RA-SNC77 cells, and show that lymphocyte binding mediated by the very late antigen-4 (VLA-4)-independent pathway is sufficient to induce the accelerated proinflammatory cytokine production. RA-SNC clones were obtained as previously described . Briefly, RA synovial tissue was cut into pieces and digested with 0.1% collagenase Type IV (Sigma, St Louis, MO, USA), 0.1% hyaluronidase (Sigma), and 0.01% DNAse (Sigma). The resultant single-cell suspension was plated onto culture dishes and maintained in DMEM (Gibco BLR, Grand Island, NY, USA) containing 10 mM HEPES, 1 mM sodium pyruvate, 50 M 2-mercaptoethanol, 10 mM NaHCO3, 2 mM L-glutamine, 1% (v/v) 100 × nonessential amino acids (ICN, Costa Mesa, CA, USA), 100 U/ml penicillin, 100 g/ml streptomycin, and 10% heat-inactivated FCS (Hyclone Laboratories, Logan, UT, USA). After four to five passages, leukocytes and macrophages were removed from the culture and only the adherent, and apparently homogeneous, stromal cells remained. These were then cloned by the limiting dilution method and examined for the ability to mediate pseudoemperipolesis. One of the RA synovial nurse cell clones, RA-SNC77, which showed a strong pseudoemperipolesis ability, was used in this study. Human B-cell lines (MC/car and Nalm-6) and a T-cell line (Jurkat) were obtained from the American Type Culture Collection (Rockville, MD, USA). A human T-cell line (Molt-17) was a kind gift from Dr J Minowada (Fujisaki Cell Center, Okayama, Japan). The B-cell and T-cell lines were maintained in RPMI 1640 medium (Gibco BRL) containing the same supplements as already described for the RA-SNC77 line. Mouse mAbs against human adhesion molecules (CD11a-5E6, anti-human CD11a/LFA-1α; AZN-L27, anti-human CD18/integrin β2; Lia1/2, anti-human CD29/inte-grin β1; 5F12, anti-human CD44; ACT-1, anti-human integrin α4β7) were obtained through the VIth Human Leukocyte Differentiation Antigen Workshop (Kobe, Japan, 1996). HP2.1 (anti-human CD49d/VLA4α), RR1/1 (anti-human CD54/intercellular adhesion molecule 1), and 1.G11B1 (anti-human CD106/vascular cell adhesion molecule 1 [VCAM-1]) were obtained from Coulter (Hileah, FL, USA). KH33 (anti-human CD49e/VLA5α) was from Seikagaku-Kogyo (Tokyo, Japan). C3 trans-ferase, an inhibitor for the small GTPase Rho, was kindly provided by Dr S Narumiya (Kyoto University Graduate School of Medicine, Kyoto, Japan). Cells were incubated with each mAb for 30 min at 4°C, and washed twice with PBS containing 0.1% BSA. The cells were then incubated with FITC-conjugated goat anti-mouse IgG for 30 min at 4°C, and washed twice. The stained cells were analyzed on an EPICS-XL flow cytometer (Coulter). Total RNA was isolated using TRIZOL (Gibco BRL) according to the manufacturer's instructions. First-strand cDNA synthesis from total RNA (1μg) was performed using Ready-To-Go™ (Amersham, Uppsala, Sweden) with an oligo(dT) primer. PCR was carried out using primer pairs specific to the connecting segment-1 (CS-1) isoform of fibronectin (5'-CATCATCAAGTATGAGAAGCC-3' and 5 '-GCTGAATACCATTTCCAGTG-3') , to SDF-1α (5'-TGGATTCAGGAGTACCTGGA-3' and 5'-CGTAT-GCTATAAATGCAGGG-3')  or to CXCR4 (5'-TTC-TACCCAATGACTTGTG-3' and 5'-ATGTAGTAAG-GCAGCCAACA-3')  with ExTaq polymerase (TaKaRa, Otsu, Japan) under the following conditions for 27 cycles: 94°C for 30 s, 57°C for 30 s, and 72°C for 30 s. As a control, a primer pair for β-actin (5'-CAAGA-GATGGCCACGGCTGCT-3' and 5'-TCCTTCTGCATC-CTGTCGGCA-3') was used. PCR products were analyzed by agarose gel electrophoresis. Lymphoma cells were pre-incubated with DMEM containing 20 μg/ml mAb for 30 min at 4°C before the adhesion assay was performed. Cultured RA-SNC77 cells were similarly pre-incubated with mAb for 30 min at 37°C before coculture. The antibody-treated cells were then used without washing for the adhesion and transmigration assay, as described later. MC/car cells were pre-incubated with DMEM containing various concentrations of C3 transferase for 48 hours. Cells were washed three times with RPMI 1640 without FCS to remove free C3 transferase and were plated onto a monolayer of RA-SNC77 cells. Adhesion between the RA-SNC77 and lymphocyte cell lines was evaluated as previously described . RA-SNC77 cells were plated into 96-well flat-bottomed culture plates at 1 × 104 cells/well and cultured for 2 days before use. Lymphocytes (4 × 106 cells/ml) were labeled with 5 M 2',7'-biscarboxyethyl carboxyfluorescein tetra-acetoxymethyl ester (Dojindo, Kumamoto, Japan) in RPMI for 1 hour at 37°C, were washed with RPMI containing 10% FCS, were resuspended in DMEM containing 10% FCS, and were plated (2 × 105 cells/well) onto a monolayer of RA-SNC77 cells with or without mAb (in triplicate). After 30 min of incubation, the wells were entirely filled with DMEM and sealed tightly. The culture plates were then placed upside down for 30 min at room temperature without agitation. Nonadherent cells were removed by discarding the medium and gently washing twice with PBS. The residual adherent cells were solubilized with 1% NP40 in PBS, and cell adhesion was estimated by measuring the fluorescence intensity of each well using a fluorescence microplate reader (Fluoroscan Ascent; Lab-systems, Helsinki, Finland). RA-SNC77 cells were plated into 12-well flat-bottomed culture plates (2 × 104 cells/well) and cultured for 2 days before use. Lymphocytes (1 × 106 cells/well) were plated onto the monolayer of RA-SNC77 cells with or without mAb, and were incubated for 2 hours. The lymphocytes bound to the surface of RA-SNC77 cells were removed by vigorous washing, and pseudoemperipolesis was examined with an inverted phase-contrast microscope. RA-SNC77 cells with more than three lymphocytes underneath them were regarded as positive for pseudoemperipolesis. At least 200 stromal cells were counted in each experiment. MC/car cells (1 × 106 cells/well) were plated onto a monolayer of RA-SNC77 cells in 12-well culture plates that had been prepared as already described. The culture supernatants were harvested after 48 hours of coculture and, after removing the cells and debris by centrifugation, stored at -20°C until needed. Concentrations of IL-6 and IL-8 in the cell culture supernatants were measured using ELISA kits (Quantikine; R&D Systems, Minneapolis, MN, USA), according to the manufacturer's instructions. Various lymphoid cell lines bound well to the RA synovium-derived stromal cell clone RA-SNC77 (Fig. 1a). The lymphocyte binding occurred in 15 min and reached a plateau by 30 min. Bound lymphocytes subsequently transmigrated beneath the RA-SNC77 cells (pseudoemperipolesis), and the transmigration reached its maximum level by 2 hours (Fig. 1b). As we previously demonstrated with synovial tissue-derived B cells , coculture with lymphoid cell lines provoked enhanced proinflammatory cytokine production from the RA-SNC77 cells, with varying degrees of induction (Fig. 2). 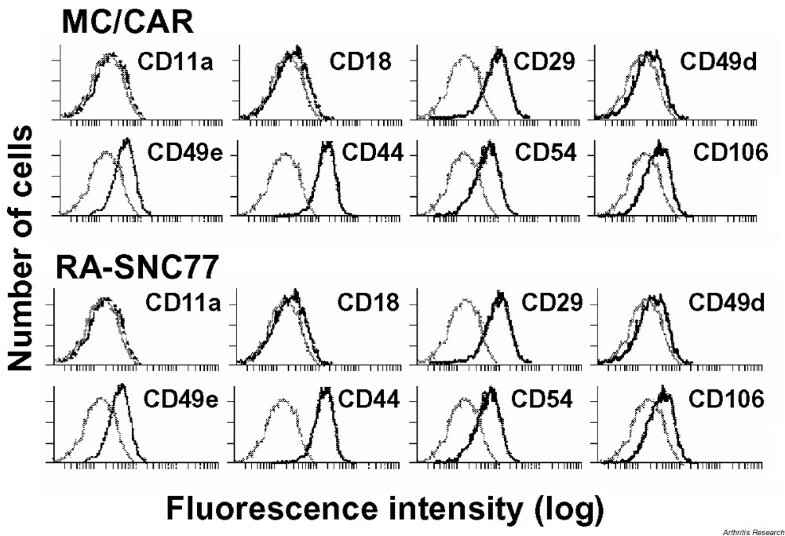 Of the cell lines examined, the human B-cell lines MC/car and Nalm-6 showed the greatest ability to induce cytokine production by the RA-SNC77 cells, and MC/car cells were used for further analysis. Cellular interaction between human lymphoid cells and RA-SNC77 cells. (a) Adhesion between lymphoid cell lines and RA-SNC77. Biscarboxyethyl carboxyfluorescein-labeled lymphoid cells (2 × 105 cells/well) were plated onto a monolayer of RA-SNC77 cells (1 × 104 cells/well) in a 96-well flat-bottomed culture plate. After 30 min of coculture, the nonadherent cells were removed and the fluorescence intensity of the adherent cells was measured. Results are expressed as the means ± standard deviation of three different experiments. (b) Transmigration of lymphoid cell lines underneath RA-SNC77 cells. RA-SNC77 cells (2 × 104 cells/well) were cultured for 2 days in a 12-well culture plate. Lymphoid cells (1 × 106 cells/well) were plated onto a monolayer of RA-SNC77 cells and incubated for 2 hours. The lymphoid cells bound to the surface of the RA-SNC77 cells were removed, and the interaction between these cells was examined with a phase-contrast microscope. RA-SNC77 cells holding more than three lymphoma cells beneath them were defined as positive for transmigration. At least 200 RA-SNC77 cells were counted in each experiment. Results are expressed as the percentage of positive cells to total cells. Values are the means ± standard deviation of three different experiments. Cytokine production from RA-SNC77 cells cocultured with lymphoid cell lines. RA-SNC77 cells (2 × 104 cells/well) were cultured for 2 days in a 12-well culture plate. Lymphoid cells (1 × 106 cells/well) were then plated onto the monolayer of RA-SNC77 cells and further incubated for 48 hours. The culture supernatants were harvested, and the concentrations of IL-6 and IL-8 were determined. MC/car cells were positive for the expression of CD11a, CD18, CD29, CD49d, CD44, and CD54 (intercellular adhesion molecule 1), but were negative for CD49e and CD106 (VCAM-1) (Fig. 3). MC/car cells were also positive for integrin α4β7 (data not shown) and achemokine receptor CXCR4 (Fig. 4). The RA-SNC77 cells were positive for CD29, CD49e, CD44, and CD54, and only weakly positive for CD106, but were negative for CD11a, CD18, and CD49d (Fig. 3). 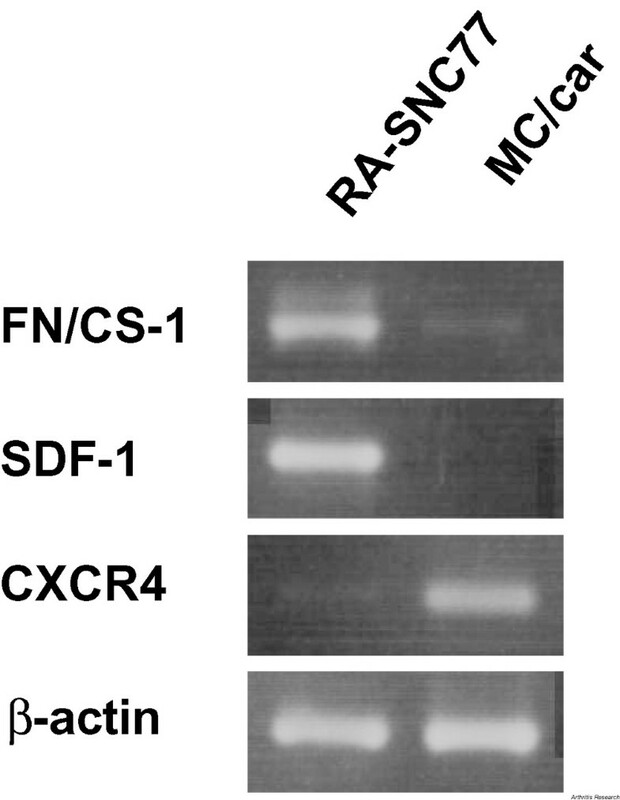 RA-SNC77 cells also expressed a CS-1 isoform of fibronectin and a chemokine SDF-1α (Fig. 4). Surface expression of adhesion molecules by MC/car and RA-SNC77 cells. Cells were stained with the indicated mAb and analyzed on an Epics-XL flow cytometer. Isotype-matched antibody was used as a negative control. Expression of the connecting segment-1 isoform of fibronectin (FN/CS-1), SDF-1 and CXCR4 in RA-SNC77 cells and MC/Car cells. Agarose gel electrophoresis analysis of cDNA fragments amplified by PCR using primer pairs specific to the CS-1 isoform of fibronectin (307 bp), SDF-1 (230 bp), and CXCR4 (206 bp). β-Actin (275 bp) was used as a positive control. To investigate the contribution of various adhesion molecules to the adhesion of MC/car cells to RA-SNC77 cells, we used their respective neutralizing mAbs. Figure 5a shows that treatment with anti-CD29 (integrin β1 chain) or anti-CD49d (integrin α4 chain) reduced adhesion of MC/car cells to RA-SNC77 cells mildly to moderately (percent of control ± standard deviation, 82.7 ± 3.1% [P < 0.05] and 61.9 ± 6.8% [P < 0.01], respectively) but that anti-integrin α4β7 was ineffective, indicating that integrin α4β1 (VLA-4) on MC/car cells mediates, at least in part, cell adhesion to RA-SNC77 cells. In contrast, the mAb against CD106 (VCAM-1) did not inhibit MC/car cells binding to RA-SNC77 cells, suggesting that CD106 does not play a significant role in adhesion of MC/car cells, although its corresponding receptor (α4β1 integrin) does. Other neutralizing mAbs against CD11a, CD18, CD44, CD49e, or CD54 showed no significant effects on MC/car cell binding (Fig. 5a). These results indicate that adhesion molecules, as yet undefined, mediate the remaining (~60%) MC/car cell adhesion to RA-SNC77 cells. The effect of antibody treatment on adhesion and transmigration of MC/car cells. (a) Binding of MC/car to RA-SNC77 cells. Biscarboxyethyl carboxyfluorescein-labeled MC/car cells (2 × 105 cells/well) were plated onto a monolayer of RA-SNC77 cells (1 × 104 cells/well) with or without mAb (20 g/ml) in a 96-well flat-bottomed culture plate. After 30 min of coculture, nonadherent cells were removed and the fluorescence intensity was measured. Results are expressed as the means ± standard deviation of three different experiments. *P < 0.05 compared with control, **P < 0.01 compared with control. (b) Transmigration of MC/car cells underneath RA-SNC77 cells. MC/car cells (1 × 106 cells/well) were plated onto a monolayer of RA-SNC77 cells (1 × 104 cells/well) with or without mAb (20 μg/ml) in a 12-well flat-bottomed culture plate. After 2 hours of coculture, MC/car cells bound to the surface of RA-SNC77 cells were removed, and the interaction between these cells was examined with a phase-contrast microscope. RA-SNC77 cells with more than three lymphoma cells beneath them were defined as positive. At least 200RA-SNC77 cells were counted in each experiment. Results are expressed as the means ± standard deviation of three different experiments. **P < 0.01 compared with control. Because integrins and CD44 have been implicated in cell motility, we next investigated the role of β1, β2, and β7 integrins, as well as CD44, in the transmigration of MC/car cells underneath RA-SNC77 cells. Figure 5b shows that treatment with anti-CD29 (integrin β1) or anti-CD49d (integrin α4) significantly reduced the transmigration of MC/car cells (46.7 ± 6.1% [P < 0.01] and 30.6 ± 17.1% [P < 0.01], respectively). 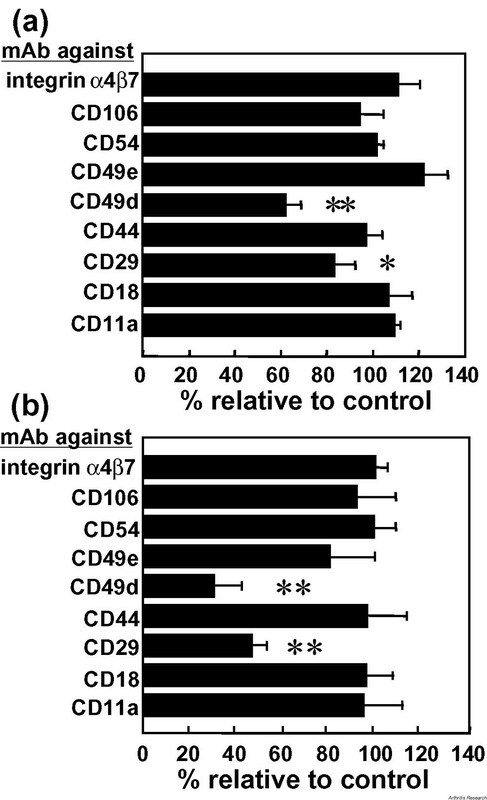 Antibodies against CD11a, CD18, CD44, CD49e, CD54, CD106, and integrin α4β7 showed no effect. These results suggest that integrin α4β1 is important for the transmigration of MC/car cells underneath RA-SNC77 cells. The transmigration process was apparently Rho GTPase dependent, as shown in Fig. 6, since pretreatment of MC/car cells with the Rho-specific inhibitor C3 transferase significantly inhibited the transmigration of MC/car cells underneath RA-SNC77 cells in a dose-dependent manner, whereas the same treatment did not inhibit the adhesion of the MC/car cells at all. The inhibition of transmigration was apparently not due to changes in the expression of adhesion molecules, because C3 transferase treatment did not affect the cell surface expression of adhesion molecules including CD11a, CD18, CD29, CD49d, CD49e, CD44, and CD54 (data not shown). The effect of C3 transferase on the adhesion and transmigration of MC/car cells. (a) MC/car cells were pre-incubated with C3 transferase at the indicated concentrations for 48 hours before coculture. Cellular adhesion and transmigration were evaluated independently, as described in Fig. 1. Values are means ± standard deviation of three different experiments. (b) and (c) Phase-contrast micrographs of MC/car cells transmigrated underneath RA-SNC77 cells. Untreated (b) or C3-treated (c) MC/car cells were plated onto a monolayer of RA-SNC77 cells. After 2 hours incubation, MC/car cells bound to the surface of RA-SNC77 cells were removed by vigorous washing. Transmigrated MC/car cells showed phase-dense and flattered morphology. We previously reported that the production of various pro-inflammatory cytokines by RA-SNC cells was significantly enhanced on coculture with human B lymphocytes, and that direct cell-to-cell contact was necessary for the augmentation of the cytokine production by the RA-SNC cells . However, the relative importance of lymphocyte binding and subsequent transmigration had not been evaluated. To investigate whether lymphocyte binding or transmigration, or both, play a role in this phenomenon, cytokine production by RA-SNC77 cells was examined using C3 transferase-treated MC/car cells, which are capable of cell adhesion but not of transmigration. 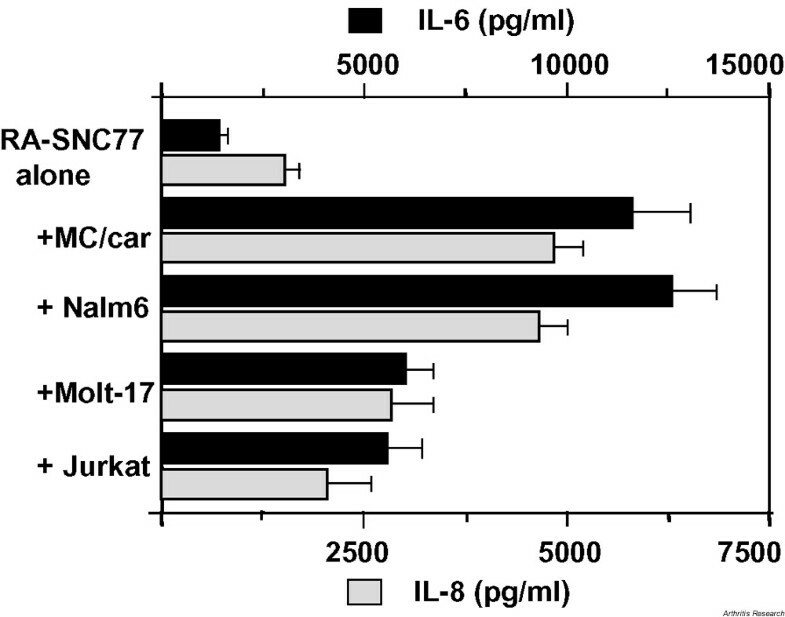 RA-SNC77 cells produced comparable levels of IL-6 and IL-8 when cocultured with either untreated MC/car cells or C3-treated transmigration-defective MC/car cells (Fig. 7), suggesting that MC/car cell binding per se is sufficient to enhance the cytokine production in RA-SNC77 cells. However, the addition of anti-CD49d (integrin α4), which inhibited MC/car cell binding to RA-SNC77 cells by approximately 50%, showed no significant inhibitory effects on IL-6 and IL-8 production. This suggests that VLA-4 (α4β1)-independent lymphocyte adhesion induced the enhanced proinflammatory cytokine production by the RA-SNC77 cells. The effect of anti-VLA-4 antibody and C3 transferase on cytokine production by RA-SNC77 cells. Supernatants were harvested at 48 hours of coculture of MC/car cells and RA-SNC77 cells, under the indicated conditions. Concentrations of IL-6 and IL-8 in the cell culture supernatants were measured using ELISA kits. Values are means of duplicate assays. RA is characterized by chronic infiltration of T lymphocytes and B lymphocytes, plasma cells, and macrophages into the synovial tissue of joints [13, 14]. High levels of proinflammatory cytokines are invariably detectable in RA synovia with severe lymphocyte infiltration [14–18], suggesting that a signal(s) directing prolonged cytokine synthesis is present within the synovial tissues of RA patients. We previously established several RA-SNC cells that produce a large amount of proinflammatory cytokines on direct contact with lymphocytes . In the present study, we focused on the mechanisms of the cell contact-mediated cytokine production by the RA-SNC cells, and examined, in particular, the adhesion pathways involved in the cell contact and the subsequent transmigration of the lymphocytes. We also attempted to verify whether cell adhesion or transmigration, or both, is important for the production of the proinflammatory cytokines by the RA-SNC cells. To assess the relative contributions of cell binding and the subsequent transmigration of lymphocytes in this phenomenon, we took advantage of transmigration-defective MC/car cells pretreated with C3 transferase. The present results suggest that lymphocyte adhesion itself is sufficient, and that transmigration is not required, for induction of a high level of cytokine production by RA-SNC77 cells. In addition, since an anti-VLA-4 mAb did not affect cytokine production by RA-SNC77 cells at all, but significantly inhibited MC/car cell binding, our results suggest that one or more VLA-4-independent adhesion pathway is involved in the enhanced cytokine production by RA-SNC77 cells. Adhesion molecules previously identified in synovial tissues in RA patients, such as VAP-1 [19, 20] and activated leucocyte cell adhesion molecule [21, 22], do not appear to be involved in the binding of lymphocytes to RA-SNC77 cells, since flow cytometric analysis indicated a lack of expression of these adhesion molecules in RA-SNC77 cells (Takeuchi et al., unpublished observation). Other undefined adhesion molecules may therefore play a key role in inducing the enhanced proinflammatory cytokine production by RA-SNC77 cells. We found that the VLA-4-dependent adhesion pathway was involved in both binding and transmigration of MC/car cells to a cloned stromal cell line, RA-SNC77. VCAM-1, a functional ligand for VLA-4, however, did not appear to contribute to these cellular interactions, suggesting that RA-SNC77 cells express an alternative ligand(s) for VLA-4. Other investigators have also reported the involvement of a VLA-4-dependent/VCAM-1-independent adhesion pathway in the interaction between bone marrow stromal cells and leukocytes [23, 24]. Previously identified ligands for VLA-4 include VCAM-1  and the CS-1 isoform of fibronectin . The CS-1 isoform of fibronectin, which has been reported to be expressed in synovial tissues in RA patients [27, 28], was detected at mRNA levels in RA-SNC77 cells, and it may function as a ligand for VLA-4, although further study is required to verify this issue. 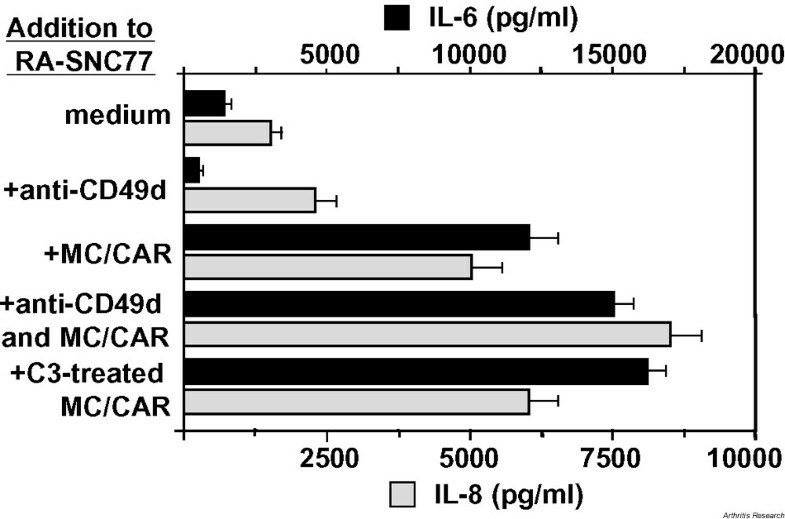 In the inflamed RA synovial tissue, various inflammatory cytokines other than IL-6 or IL-8 are readily detected [18, 29]. Certain proinflammatory cytokines, such as tumor necrosis factor alpha and IL-1, may participate in the dysregulated production of multiple cytokines in the RA synovial tissues. Although production of tumor necrosis factor alpha and IL-1 by RA-SNC cells is limited to low levels even after stimulation with lymphocytes , such regulatory cytokines may contribute the cell contact-dependent production of IL-6 and IL-8 observed in this study. Enhanced expression of proteolytic enzymes, such as cathepsins, matrix metalloproteases [30, 31], and aggrecanases [32, 33], is also seen in the inflamed RA synovial tissue, and these proteolytic enzymes are thought to be involved in the cartilage and joint destruction. Whether there is any functional link between the lymphocyte adhesion-driven cytokine production and the enhanced expression of the proteolytic enzymes in the RA synovium merits future investigation. Burger et al. recently demonstrated that, other than specialized nurse-like stromal cells, conventional fibroblast-like synoviocytes and IL-4-stimulated dermal fibroblast-like cells also can support pseudoemperipolesis of Blymphoid cells. They also found that, irrespective of their origin, the ability of fibroblastic cells to support B-cell pseudoemperipolesis is dependent on their expression of SDF-1 and VCAM-1, both of which are also detected in RA-SNC77 cells. These findings suggest that the specialized nurse-like cells and conventional fibroblast-like cells share some functional similarities to support B-cell pseudoemperipolesis while the nurse-like cells established from synovial tissues of patients with RA are distinct from other stromal cells derived from non-RA patients in both morphology and cellular functions, particularly proinflammatory cytokine production . Further comparative studies are needed to characterize fibroblastic-stromal cells and nurse-like cells at molecular levels. In summary, the present results indicate that lymphocyte binding per se is critical for enhanced proinflammatory cytokine production by RA-SNC77 cells. While transmigration of lymphocytes underneath the RA-SNC cells did not appear to play a significant role in the production of IL-6 and IL-8, this biological process may be involved in the production of other cytokines and/or proteinases. This nurse-like cell activity, which is seen in stromal cells isolated from the synovia of RA patients but not in those from disease-free controls, may alternatively influence the effector functions of infiltrated lymphocytes in RA synovia. Although VLA-4 is involved in both lymphocyte adhesion to and transmigration beneath RA-SNC cells through the interaction with non-VCAM-1 ligand(s), the VLA-4-independent adhesion pathway appears to be important for the cell contact-induced cytokine production by RA-SNC77 cells. Further investigation to identify the adhesion receptors necessary for cell contact-dependent activation of the nurse-like stromal cells may lead to novel therapeutic strategies through regulating the functions of the nurse-like stromal cells in RA patients. Nurse-like stromal cell lines, which were established from the synovial tissue of patients with RA, abundantly secrete proinflammatory cytokines on coculture with lymphoid cells. We analyzed the molecular events required for the enhanced proinflammatory cytokine production by a RA-SNC line (RA-SNC77), and showed that VLA-4-independent lymphocyte adhesion alone, but not the subsequent Rho-GTPase-dependent transmigration of the lymphocytes, can induce the upregulated cytokine secretion by the nurse cells. We thank Dr S Narumiya for the C3 exoenzyme and Dr J Minowada for the Molt-17 cells. We also thank S Yamashita and M Komine for secretarial assistance. This work was supported in part by a grant from the Japanese Ministry of Education and the Organization for Pharmaceutical Safety and Research (OPSR), and by a grant from Funds for Comprehensive Research on Long Term Chronic Disease from the Ministry of Health and Welfare of Japan, and the Program for Promotion of Fundamental Studies in Health Science of the Organization for Drug ADR Relief, R&D Promotion and Product Review of Japan.